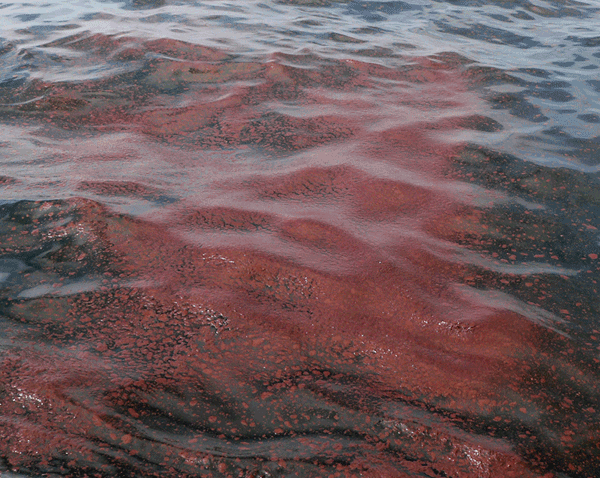 A method is described to create qualitative images of thick oil in oil spills on water using near-infrared imaging spectroscopy data. The method uses simple "three-point-band depths" computed for each pixel in an imaging spectrometer image cube using the organic absorption features due to chemical bonds in aliphatic hydrocarbons at 1.2, 1.7, and 2.3 microns. The method is not quantitative because sub-pixel mixing and layering effects are not considered, which are necessary to make a quantitative volume estimate of oil. A rapid, qualitative, remote sensing method is needed to map the locations of thick parts of an oil spill. While simple color imagery can show locations of thick oil (fig. 1), it is difficult to assess relative thickness or volume with such data. The reason for this is illustrated in figure 2. Figure 2 shows reflectance spectra of a sample of oil emulsion from the Gulf of Mexico 2010 spill containing approximately 40 percent water. In the visible part of the electromagnetic spectrum, approximately 0.4 to 0.7 microns, the color of an oil emulsion (which is significantly thicker than the wavelength of light) changes little for different thicknesses. But in the near-infrared, figure 2 shows large change in reflectance because the absorption from the oil is less at those wavelengths. At infrared (IR) wavelengths, both the reflectance levels and absorption features due to organic compounds vary in strength with oil thickness. Color composite images assembled from both visible and near-IR wavelengths can be used to make images of thick oil (fig. 3A), but such intensity images also show strong reflections from clouds and the ocean surface (i.e., sunglint). Spectroscopic analysis of the reflectance spectra within remote-sensing imagery can, however, resolve the absorptions due to the organic compounds in oil and can better separate the spectral shape of oil (fig. 3B) from that of other materials in the imagery (for example, Clark and others, 2003a). A method to analyze absorptions due to specific materials is called absorption-band depth mapping (Clark and others, 2003b). Clark and others showed that simple three-point-band depth mapping will show the location of absorption features but can not identify specific compositions of compounds causing these features when multiple compounds have absorptions near the same wavelength. In the case of open ocean images, comprised of pixels containing water, oil/water mixtures, and clouds, the organic compounds in the oil and oil/water mixtures have absorption features that are distinct from those from water and clouds. These spectral differences allow us to map qualitative variations in oil abundance. The National Aeronautics and Space Administration (NASA) Airborne Visible/Infrared Imaging Spectrometer (AVIRIS), a high fidelity imaging spectrometer, is being flown by the Jet Propulsion Laboratory (JPL)/NASA over the 2010 Gulf of Mexico oil spill. AVIRIS measures a spectrum of the surface at each pixel from 0.35 to 2.5 microns (the visible spectrum is: blue: 0.4 micron, green 0.53 micron, deep red 0.7 micron) in 224 channels. AVIRIS data from May 6 are shown over a region that includes the well head source of the spill (fig. 3). The method used to produce a three-point band depth map, indicating potential locations of thick oil is, as follows. Radiance data are converted to surface reflectance using a two step process described by Clark and others (2003a). where Rb is the reflectance around the absorption maximum (minimum reflectance), Rl is the reflectance of the left continuum end point and Rr is the reflectance of the right continuum end point. Equation 1 is an approximation of the more formal equation in Clark and Roush (1984) where D = 1 – Rb / Rc and Rc = (R1 + Rr)/2 approximates the reflectance of the continuum at the maximum absorption. This approximation is adequate for creating rapid qualitative images. A more rigorous absorption band shape least squares fit of the absorption band shape after Clark and others (2003a) can also be done to produce images with lower noise and better discrimination between compounds. But the results of images of absorption band depth produced by any such band-depth method alone are qualitative because effects from sub-pixel mixing (as indicated in fig. 1, for example) have not been taken into account. For AVIRIS, the following wavelength intervals were used in three-point band-depth computations. Rb = average of the channels in the interval from 1.197 to 1.216 microns. Rl = average of the channels in the interval from 1.073 to 1.102 microns. Rr = average of the channels in the interval from 1.273 to 1.293 microns. Rb = average of the channels in the interval from 1.712 to 1.732 microns. Rl = average of the channels in the interval from 1.622 to 1.642 microns. Rr = average of the channels in the interval from 1.782 to 1.802 microns. Rb = average of the channels in the interval from 2.287 to 2.327 microns. Rl = average of the channels in the interval from 2.198 to 2.238 microns. Rr = average of the channels in the interval from 2.407 to 2.447 microns. The band-depth images produced from these three calculations are combined into a color composite image as follows: the 2.3-micron feature in the red channel, the 1.73-micron feature in the green channel, and the 1.2-micron feature in the blue channel. This method finds any organic compounds, not just oil. For example, in the image in figure 3, small bright pixels are boats and the paint on the boats shows spectral features due to the organic compounds in the paint. Similarly, large areas of ocean containing floating garbage that includes painted materials or plastics would also show in such images. Such false positives would be easily recognized by onsite cleanup crews. Methods like that outlined here have been used in many other applications, for example mapping hydrocarbons on Saturn's moon Titan (Brown and others, 2008; Clark and others, in press) and terrestrial applications (Clark and others, 2003a and references therein). 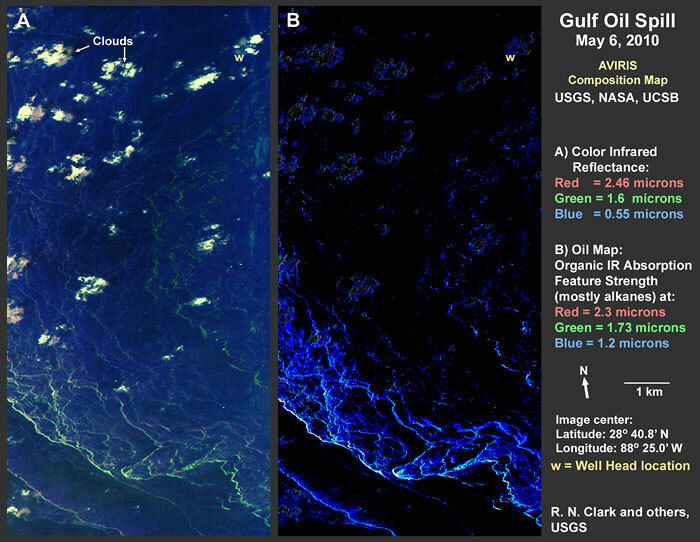 The results shown here highlight the utility of imaging spectrometer measurements across the visible, near-IR and shortwave-IR wavelengths for oil spills in the ocean. The method presented here provides a fundamental image analysis method, using focused wavelengths centered within and on the edges of oil-related absorption features, as a means for detecting thick oil. A simple computation of absorption-band depth using reflectance spectra from imaging spectrometers, which includes the wavelength range where petroleum compounds produce absorption features in the near-IR can be used to locate areas with relatively thick oil. Such derivative images might be useful to guide cleanup efforts to thicker parts of the spill and as oil approaches shore the images might be useful to target efforts to mitigate the worst parts of the spill. Brown, R.H., Soderblom, L.A., Stoderblom, J.M., Clark, R.N., Jaumann, R., Barnes, J.W., Sotin, C., Buratti, B., Baines, K.H., and Nicholson, P.D., 2008, The identification of liquid ethane in Titan's Ontario Lacus: Nature, v. 454, no. 7204, p. 607–610, doi:10.1038/nature07100. Clark, R.N., Curchin, J.M., Barnes, J.W., Jaumann, R., Soderblom, Larry, Cruikshank, D.P., Brown, R.H., Rodriguez, S., Lunine, J., Stephan, K., Hoefen, T.M., Le Mouelic, S., Sotin, C., Baines, K.H., Buratti, B., and Nicholson, P., in press, Detection and mapping of hydrocarbon deposits on Titan: Journal of Geophysical Research. Clark, R.N., and Roush, T.L., 1984, Reflectance spectroscopy—Quantitative analysis techniques for remote sensing applications: Journal of Geophysical Research, v. 89, no. B7, p. 6,329–6,340. Figure 1. Image of oil emulsion from the Gulf of Mexico oil spill. Photograph taken on May 7, 2010, by Gregg Swayze/Sonia Gallegos. Figure 2. Spectra of oil emulsion from the Gulf of Mexico oil spill. Sample collected May 7, 2010. At visible wavelengths the oil is very absorbing and does not change color significantly with depth. At infrared wavelengths, both reflectance levels and absorptions due to organic compounds vary in strength with thickness. This sample contains approximately 40 percent water as determined by heat separation. Controlled sample depths were created in a cell on a glass window placed over a black substrate and a water substrate. The reflectance was measured over each of these substrates (no difference was observed). Figure 3. Color-composite imagery and derived three-point band-depth oil map illustrating areas of potentially thick oil. The images were produced using data from the Airborne Visible/Infrared Imaging Spectrometer (AVIRIS), flown aboard an ER–2 aircraft at 28,000 feet above sea level. AVIRIS measures a spectrum of the surface at each pixel from 0.35 to 2.5 microns (the visible spectrum is: blue: 0.4 microns, green 0.53 microns, deep red 0.7 microns) in 224 wavelengths. This fine spectral sampling allows discrimination of absorptions due to specific compounds in the scene. A, a color-infrared composite image in which reflectance at 2.46 microns is assigned the color red, reflectance at 1.6 microns is assigned green, and reflectance at 0.55 microns is assigned blue. B, an image produced by assigning the measured strength of the absorption at 2.3 microns as red, assigning the absorption strength at 1.73 microns to green, and assigning the absorption strength at 1.2 microns to blue. The absorption at 2.3 microns is intrinsically the strongest organic absorption in the oil in this spectral range and is sensitive to thin/small amounts of oil. The absorption at 1.73 microns is sensitive to greater amounts of oil. The absorption at 1.2 microns is weaker and needs the greatest amount of oil to register. For such thick layers of oil, the stronger absorptions are saturated and do not change significantly (as shown in figure 2) leaving the 1.2-micron feature to probe the thickest oil. The image on the left (A) shows the position of the oil well head (marked with a "w"). Pixel spacing is 8.5 meters so each pixel covers about 72 square meters. The images shown cover about 67 square kilometers, and are a subset of a long flight line. Data analysis indicates oil was detected in a total of more than 4 million square meters (more than 57000 pixels) in this scene. Puffy white structures in A are clouds (and their shadows, some of which look tan). The clouds show in analysis (B) as low level organic signatures because light reflected from the ocean surface contains oil and that light reflects into the clouds. Thicker clouds block most of that reflected light so there is no oil signature where the clouds are thick, creating what appear as doughnut shapes. Small dots, some of which appear white in A and red or green in B, are boats whose paint reflects light with organic spectral signatures. 1U.S. Geological Survey, Denver Federal Center, Denver, Colorado, 80225. 2Marine Science Institute, University of California, Santa Barbara, CA, 93106. 3California Institute of Technology, Jet Propulsion Laboratory, 4800 Oak Grove Dr., Pasadena CA 91109-8099. 4Desert Research Institute, 2215 Raggio Pkwy, Reno, NV 89512. 5Dar Roberts, Geography Dept., University of California, Santa Barbara, CA, 93106. 6National Aeronautics and Space Administration (NASA) Dryden Flight Research Center, P.O. Box 273, Edwards, California 93523-0273. 7University Affiliated Research Center, University of California, Santa Cruz/NASA Ames Research Center, Moffett Field, California, USA. Clark, R.N., Swayze, G.A., Leifer, I., Livo, K.E., Lundeen, S., Eastwood, M., Green, R.O., Kokaly, R., Hoefen, T., Sarture, C., McCubbin, I., Roberts, D., Steele, D., Ryan, T., Dominguez, R., Pearson, N., and the Airborne Visible/Infrared Imaging Spectrometer (AVIRIS) Team, 2010, A method for qualitative mapping of thick oil spills using imaging spectroscopy: U.S. Geological Survey Open-File Report 2010-1101.